Support the student emergency fund. The student emergency fund was established to help students during an exceptional time of emergency need. By making a gift of any amount, you are paying it forward and leaving a lasting impact at Clarke for current and future students. Students may contact Vice President for Student Life Kate Zanger at (563)588-6517 for more information regarding the application process. 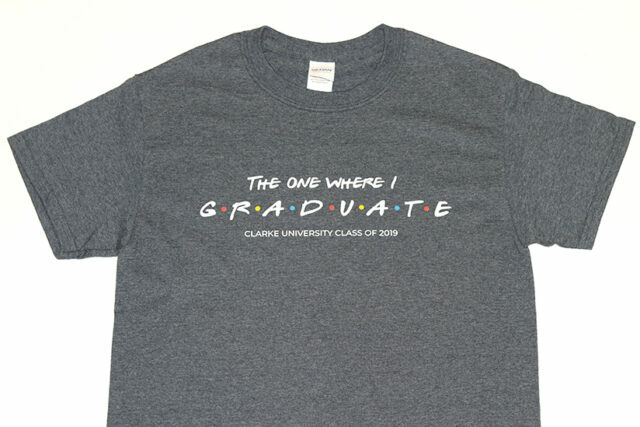 Purchase your Class of 2019 t-shirt here. All proceeds will support the Student Emergency Fund. Small gifts make a big impact! Each year, current students add to this fund and ensure its growth. With your support, and the support of students for years to come, we will be able to assist our fellow Clarkies in times of need. You can also support the cause by becoming an Institutional Advancement work study, volunteer or intern. Contact Jodi Hooks at (563)588-6553 to learn more. Knowing donors are so generous to help me further my education gives me even more drive to work hard day in and day out because I hope to do the same for someone else in the future.